If you’re a fan of watching NFL pundits trip over themselves to use words like “intangible” and “Wonderlick” with the fury of a comment section about Jameis Winston, then you’re in luck! It’s the NFL draft, the most exciting time of peak hyperbole and narrative season. But if you’re like us, you’re also tired of having to steal Mel Kiper’s draft insight from your friend’s ESPN Insider account. We just want to know what you think Mel. Why are your thoughts so expensive (this one time of the year)? 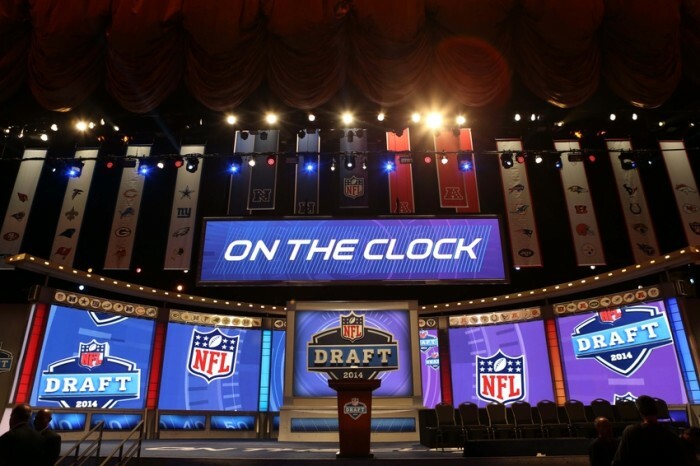 Luckily for you, our faithfully cheap reader, we’ve cut out the fat to give you this up-to-the minute mock draft, breaking down what you’ll be hearing all weekend from the pundits (except Todd McShay. We all know he just rides Kiper’s coat tails anyway). Local product with character issues will surely be looked at as a draft bust in years to come. Product of a system, not athletic with lots to prove, but the team is garbage so even if he doesn’t get injured, he’ll carry the entire load on his back. They did the QB thing last year and now have to get someone on the other side of the field. I dunno, a big guy or something. Whoever it is, we’ll screw it up. Can we trade it for a 35-year-old defensive player? No? How about a quarterback? Somebody has to protect their not good quarterbacks. They haven’t taken a receiver in the first round in 14 years. But Jay Cutler only wants to know what brand of smokes he likes. Someone to protect the child-like cranium of Eli Manning. So many issues, only one pick. Just not another Sam Bradford! Teddy Bridgewater needs a friend. Drew Brees is literally one hundred years old and they just lost their best receiver. Their running game is so bad, they’re thinking of bringing in some Greyhounds from the track to try out. As long as whoever it is isn’t wearing khaki pants on draft night, they’re fine. They better just trade the pick to a sci-fi genetic scientist who can clone JJ Watt for every position. One of Philip Rivers kids, probably. Alex Smith and Andy Reid need to find a new player to disappoint. A trade or an Oregon Duck. The bigger question is, why Marvin Lewis still gets to make this pick? HOW DOES HE STILL WORK FOR THE BENGALS? Bruce “Adult Man who wears Kangol’s” Arians has a trick up his sleeve. Can he take the blame off of Cam Newton? Probably not. Let’s do it anyways! The Ravens have so few decent receivers, they’re not even doing background checks anymore. All first-round draft picks of the Broncos have to buy a Papa John’s franchise from Peyton Manning. He has to be Andrew Luck’s best friend, because it’s starting to get lonely out there for old Lucky. Still no contingency plan for 100 year old Drew Brees? No? Okay, probably someone to protect him then. They should probably do a background check this time. Andy Livingston lives in Baltimore and writes about sports.